For those of you who watch CNBC then you all know of Mad Money host, Jim Cramer. His antics are funny, his sound whistles are amusing, and his special effects keep us entertained but when it comes to his knowledge and investment advice he is not the person you should be listening to. Just recently Jim Cramer was caught in another stock flip flop, hyping Facebook before the IPO and then changing his tune following the chaos that ensued following. This is just another case exposing Cramer, showing his inability to pick great investments and it’s scary because so many people watch his show and take his advice for all their investment needs. Mad Money is an entertaining show but it’s investment advice is clouded and very questionable so we urge our readers and everyone else to always use their own judegement when it comes to making any investment decisions and especially don’t rely on the sole advice of Jim Cramer. We all remember his Bear Sterns calls – and his more recent Chesapeake Energy hype…and now Facebook. If you took his advice on the Facebook IPO and got “in on the deal” and tried “to get your hands on as many shares as possible” – you’d be out a pretty penny right now. Jim Cramer couldn’t annoy his viewers enough pushing them to invest in Facebook claiming it was going to offer great returns. 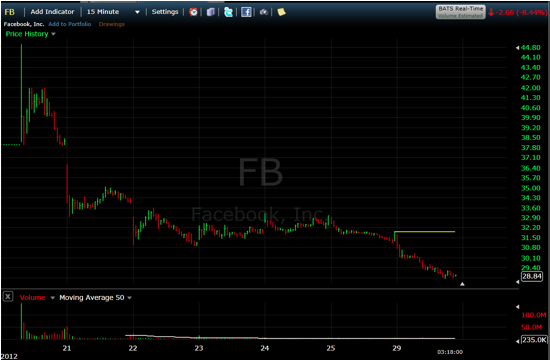 The graph is all you need to see to know how Facebook’s IPO turned out. 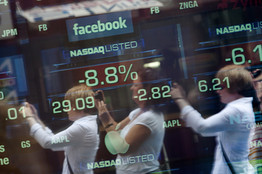 And while Facebook’s stock started to tank, Cramer’s opinion and advice shifted. We commend Todd Ganos for exposing Jim Cramer when many wouldn’t. Just watch it for yourself, the two clips below show exactly what we were talking about with Jim Cramer flip flopping on his opinion of Facebook. NextWhat Assets Google Currently Has?